This week, Alaska Airlines demonstrated a set of next-generation flight procedures that dramatically reduced fuel consumption and carbon emissions. Under the banner of its “Greener Skies” project, AA used satellite-based guidance technology that enabled aircraft to fly more efficient landing patterns, which are shorter and more direct. The Seattle-based airline estimates that such improved descent approaches would burn 2.1 million less gallons of fuel and cut carbon emissions by 22,000 metric tons, or 35%. “Ultimately this project could serve as a blueprint for next-generation aviation technology throughout the country,” said Ben Minicucci, COO of Alaska Airlines. AA has been perfecting its precision flight-guidance technology, or Required Navigation Performance (RNP), since the mid-1990s, and the company’s planes are capable of landing in some of the most remote and challenging airports in the world. Commercial aircraft usually follow long approach patterns with a “series of stair-step descents.” RNP enables planes to descend from a higher altitude along a shorter route that uses less power. Such seemingly simple modifications to landing patterns will create a big change on environmental impact, especially when coupled with other “open skies”-type thinking such as Honeywell’s SmartPath landing system. RNP technology is part of the FAA’s Next Generation Air Transportation System, a plan to modernize the country’s flight system by 2025. 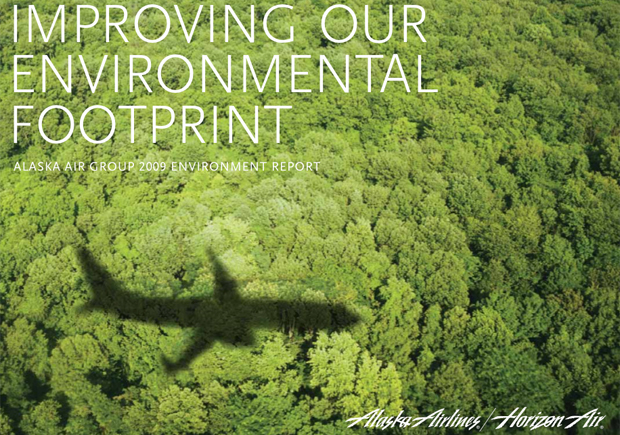 Alaska Airlines is the only major U.S. airline to be completely RNP-equipped, and judging from the effectiveness of the technology so far, it looks like the FAA is off to a good start toward greening our blue skies.